SME Warrington 9th and 10th February a success! 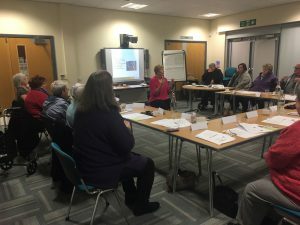 On February 9th and 10th we held our first Self-Management Event in the area of Warrington. 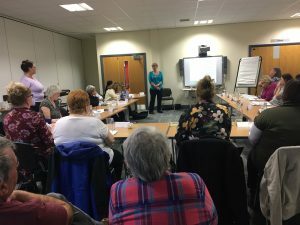 The event was well-attended with over 23 people with personal experience of arthritis. 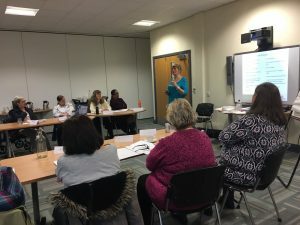 Held at the Orford Jubilee Neighbourhood Hub, the event took place over two half-days and explored approaches to better manage the symptoms of arthritis through healthy eating, physical therapy, mindfulness, exercise and pain management. The event was attended by our Warrington-based Arthritis Action Member and GB Paralympian archer Leigh Walmsley. 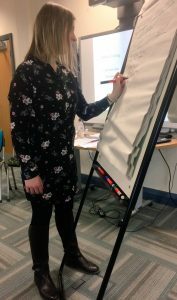 Lead presenter, Debbie Rose, is one of Arthritis Action’s Trustees and an accredited self-management trainer who lives with arthritis herself. 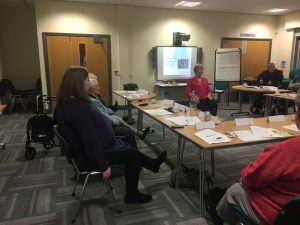 Debbie was joined by Leah Boylan, the Charity’s Groups and Events Officer, who gave a talk on how distraction techniques can help alleviate the symptoms of arthritis. Attendees were also provided the opportunity to share their stories, questions and tips and learn from one another. This free event was open to people living with all forms of arthritis. Arthritis Action runs self-management events across the UK to offer people with arthritis the platform to share their experiences, ideas and feelings with others in a safe and friendly environment, whilst helping them overcome the physical and emotional problems associated with the condition, to improve their quality of life.